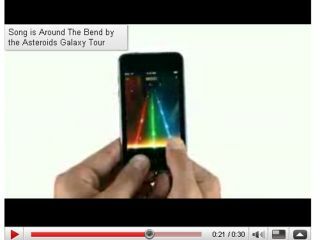 What's that cool song in the iPod touch commercial? When Apple introduced the iPod touch a few months ago, they called it "the funnest iPod ever". What they didn't say was the commercial for the touch would feature a song that could also be described as "funnest". If you've seen the ad (click here to check it out), you know what we're talking about: a grooving drum beat, bopping bass, funky horns,the all-important cowbell, and a female voice that assures us there are some "good, good times around the bend." For the touch commercial, the good folks at Apple have plucked from obscurity the duo of Lars Iversen and Mette Lindberg (she's the one picture above, natch), from Copenhagen, Denmark. They call themselves The Asteroids Galaxy Tour and their song Around The Band is catching on mighty quick. "It's a song about sexual energy," Iversen says. "An energy that you want so bad from someone, and you'd do whatever it takes to get it." Hey, works for us - the song, that is. You know, if Apple ever gets tired of making cool computers and gadgets, they might want to think about going into the music business. Oh, wait... they already have. Want to see the music video to Around The Bend, as well as a couple of other insanely happening tracks? Click on The Asteroids Galaxy Tour's website.